The Five Boro Bike Tour may be sold out, but the day before, on May 2, you can enjoy a leisurely pedal through Brooklyn with the Brooklyn Greenway Initiative. 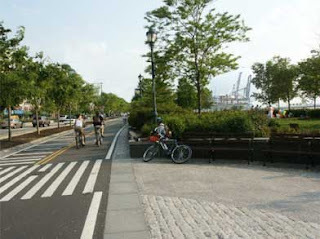 The 7th Annual Future Brooklyn Waterfront Greenway Bike Tour kicks off at 10 a.m. in Greenpoint at the northern end of Manhattan Avenue, ending 10 miles later on the Red Hook waterfront. The event is free (though donations are welcome), and includes updates on the Brooklyn Waterfront Greenway, a 14-mile path along Brooklyn's western waterfront. To RSVP, send your full name and contact information to ride2009(at)brooklyngreenway.org. And, if you're not in the city-wide bike tour on May 3 but want to catch the sea of cyclists as they swarm through your neighborhood, you can find the tour route here.